Treat your family with this sweet treat made from scratch. Bake with sweet yeast dough, coated with butter, brown sugar and chopped nuts that's certain to satisfy. 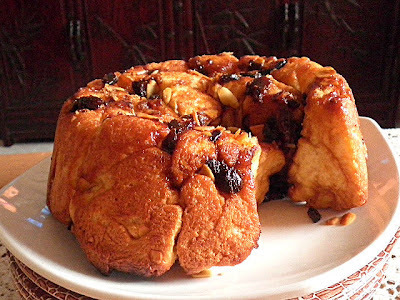 Oozing with warm caramel and nuts, this makes a great breakfast or serve as a special treat for your family and friends. The sticky and finger licking bread is best eaten warm. It is well worth the bit of extra effort. Combine butter, warm milk, sugar and salt in a small bowl. Place flour and yeast in a mixing bowl. Gradually add milk mixture to the flour, forms into soft dough. Transfer onto floured board, knead by hand or mixer until smooth. Transfer dough into oiled and covered bowl, let rise until doubled for 1-1.5 hours. Generously grease 8 in round pan, sprinkle a tablespoon of brown sugar in a greased pan. Combine remaining brown sugar, dried fruit, melted butter and nuts into a large bowl. Gently punch the dough down, pinch the dough into 1.5 in balls. Drop the balls into brown sugar mixture, toss to combine. Arrange evenly in pan, sprinkle remaining nuts and fruit over top. Cover and let sit in the pan for 45 minutes. Towards the end of rising time, preheat oven @ 190 C.
Let sit in the pan for 10 minutes, loosen the edges before inverting onto a serving platter. Aww, this makes me hungry!! wow!thats a work of art..........really nice. This pullup bread is real treat for bread lovers. What a treat.. looks perfect..! I love this fruit n nut bread. Yum! mmmm, im craving for a piece just seeing it, looks so good! My My that looks soo yummy! Nuts and caramel..Must b super yummy! 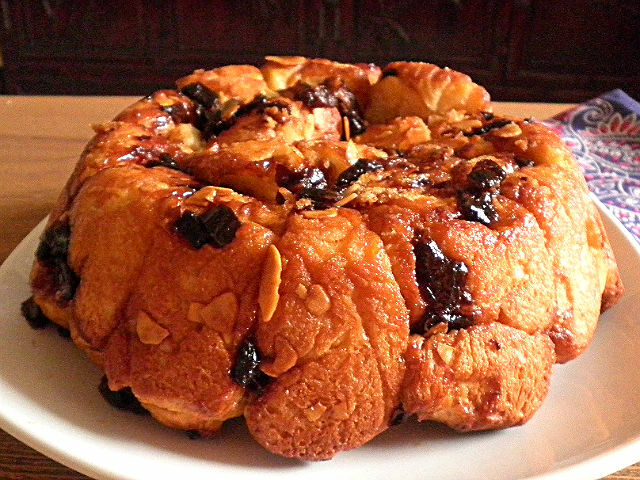 Around here we like to call that Monkey Bread! And I have to say I love it, this recipe looks delicious. I've never had it with fruit in it, definitely will have to try! Yummy yum delicious bake..Looks awesome!! Wooowww this bread with nuts and dried fruits looks really heaven! Feel like trying as soon as possible...thanks for sharing dear! Yummy n delicious looking bread. Wow, what a sight for hungry eyes. I love how busy this treat is with flavors and textures - definitely a dessert to be excited about! Looks very inviting and yummy. definitely want to give it a try. It looks wonderful and very tempting. wow..it looks so good,very tempting. I so love pull apart bread, I just pinned this and will fix it for my grandchildren:) I am hopping over from Taste this Thursday Blog Hop. I am now following you and would love a follow back. Thanks, I so enjoyed the visit. Great pics looks super good. This looks SO GOOD! I've never made a pull apart bread, but this one looks too good to pass up. Love the topping and everything about this! Love this recipe! Looks delicious! Thanks for sharing at Heavenly Treats Sunday Link Party! Oh yum, this looks just delicious! Thanks for sharing at The Fun In Functional! 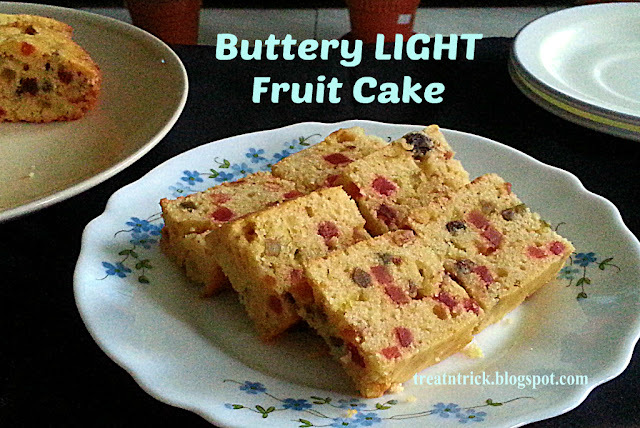 It sounds wonderful, thank you for sharing the recipe at The Really Crafty Link Party. Pinned.